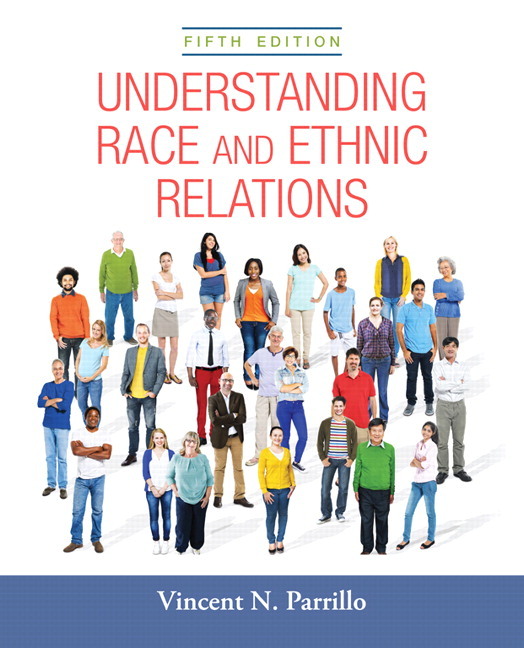 Understanding Race and Ethnic Relations examines the historically complex nature of intergroup communication. The text takes interpersonal relations into account within the larger context of society to understand cross-cultural interaction as a whole. Social science theory, research, and analysis are applied to scrutinize historical patterns that have shaped modern cultural relations. 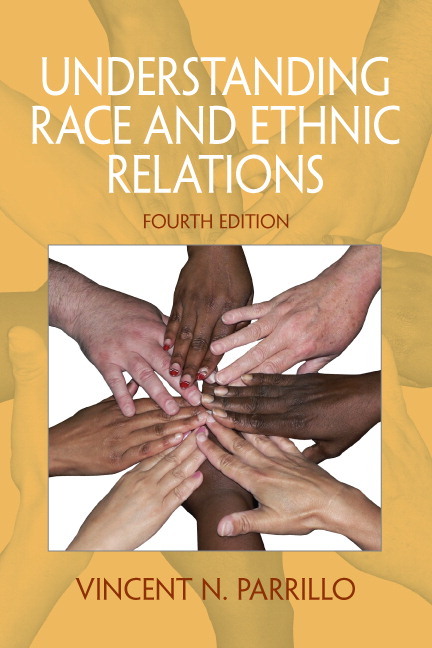 The Fifth Edition uses core sociological concepts to examine intergroup relations from a non-objective standpoint. Beginning with a general examination of culture, social class, and the notion of power, the text broadens to help students understand the root of discrimination and conflict by applying sociological theory. Widely celebrated throughout the globe, this text presents the very real issues of discrimination, conflict, and misunderstanding through a realistic, factual lens. MySocLab for Race and Ethnicity courses extends learning online, engaging students and improving results. Media resources with assignments bring concepts to life, and offer students opportunities to practice applying what they’ve learned. And the Writing Space helps educators develop and assess concept mastery and critical thinking through writing, quickly and easily. Please note: this version of MySocLab does not include an eText. 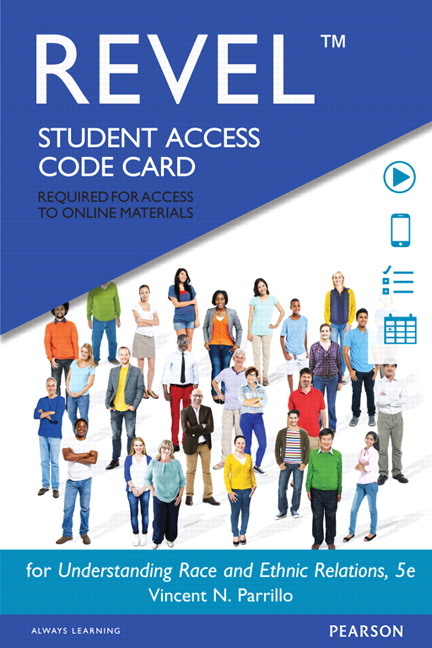 Students, if interested in purchasing this title with MySocLab, ask your instructor for the correct package ISBN and Course ID. Instructors, contact your Pearson representative for more information. 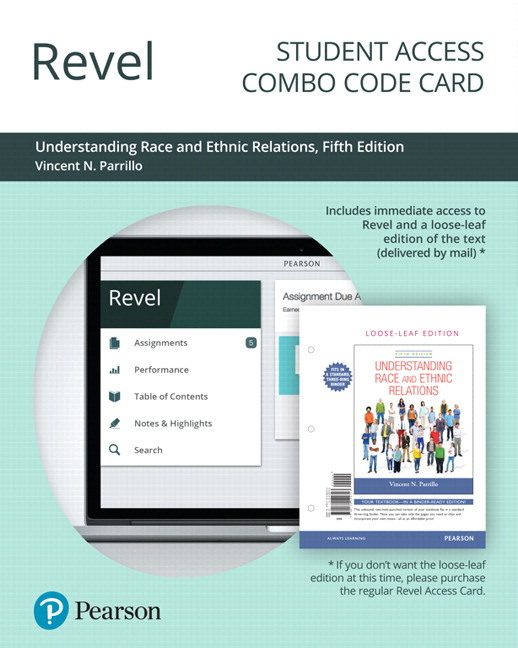 Understanding Race and Ethnic Relations, Fifth Edition is also available via REVEL™, an immersive learning experience designed for the way today's students read, think, and learn. Learn more. Discusses "The Dillingham Flaw" and the importance of viewing the foreign-born presence in the U.S. within a larger context – from a sociological perspective – in order to avoid inaccurate historical comparisons. NEW! and UPDATED! 38% of the 341 references in the text have been updated from the previous edition or added in as new information. UPDATED! The most current Census Bureau projections are examined to speculate what U.S. race, religion, and ethnicity might be like in the mid-21st century. NEW! Chapter 1 assesses the largest ever national study on social distance. UPDATED! Chapter 2 discusses the most recent ethnic and racial demographics in professional sports. NEW! Chapter 4 includes a new International Scene feature about the 2012 youth minority riot in France. UPDATED! Chapter 5 contains the most recent information on affirmative action in universities. NEW! Chapter 7 contains a new “Reality Check” feature that highlights immigrant contributions to the United States, as well as new terminology for English acquisition classes and a discussion of the most recent Supreme Court ruling on bilingual education. NEW! Boxes that provide reactive comments from recent student readers are scattered throughout each chapter to create an interactive learning experience. NEW! Chapter 6 includes a map that displays the geographic scattering of hate groups throughout the United States. Reality Check features in each chapter applies key concepts to real life in the context of the college experience or everyday interactions. Tables throughout the text help readers grasp statistics and data more easily. International Scene Boxes offer cross-cultural examples of major sociological theories. Discussion Questions end each chapter to review important information and spark dialogue within the classroom. Internet Activities at the end of each chapter offer students the opportunity to explore chapter topics further or test their knowledge with supplementary online activities. MySocLab for Race and Ethnicity courses extends learning online, engaging students and improving results. Media resources with assignments bring concepts to life, and offer students opportunities to practice applying what they’ve learned. Please note: this version of MySocLab does not include an eText. • Social Explorer personalizes key course materials (graphs, maps, and other infographics) with data from specific locations, giving students opportunities to explore how the trends they are learning about impact them on a local level. They can view statistics and trends, such as unemployment rate and demographic shifts, for their town or county, and compare this data with other parts of the world. Students can also analyze maps at different points in time, or in comparison to one another, to easily identify how trends emerge, grow, and wane geographically. Social Explorer activities link back to assessment within MySocLab. • With the Core Video Series within MySocLab, students are engaged with, and exposed to, topics through several different sociological lenses. The Core Video Series features six video types for all 21 major topic areas in sociology. By viewing ideas through different lenses, students are more engaged with the content, enhancing their own critical-thinking skills, and ultimately learning to think like sociologists. • Learning Management System (LMS) Integration lets instructors link any LMS platform to MyLab. Access MyLab assignments, rosters and resources, and synchronize MyLab grades with your LMS gradebook. For students, new direct, single sign-on provides access to all the personalized learning MyLab resources that make studying more efficient and effective. UPDATED! 38% of the 341 references in the text have been updated from the previous edition or added in as new information. Chapter 1 assesses the largest ever national study on social distance. Chapter 4 includes a new International Scene feature about the 2012 youth minority riot in France. Chapter 7 contains a new “Reality Check” feature that highlights immigrant contributions to the United States, as well as new terminology for English acquisition classes and a discussion of the most recent Supreme Court ruling on bilingual education. Boxes that provide reactive comments from recent student readers are scattered throughout each chapter to create an interactive learning experience. Chapter 6 includes a map that displays the geographic scattering of hate groups throughout the United States. Born and raised in Paterson, New Jersey, Vincent N. Parrillo experienced multiculturalism early as the son of a second-generation Italian American father and Irish/German American mother. He grew up in an ethnically diverse neighborhood, developing friendships and teenage romances with second- and third-generation Dutch, German, Italian, and Polish Americans. As he grew older, he developed other friendships that frequently crossed racial and religious lines. Professor Parrillo came to the field of sociology after first completing a bachelor’s degree in business management and a master’s degree in English. After teaching high school English and then serving as a college administrator, he took his first sociology course when he began doctoral studies at Rutgers University. Inspired by a discipline that scientifically investigates social issues, he changed his major and completed his degree in sociology. Leaving his administrative post but staying at William Paterson University, Prof. Parrillo has since taught sociology for more than 30 years. He has lectured throughout the United States, Canada, and Europe and has regularly conducted diversity leadership programs for the military and large corporations. His keynote address at a bilingual educators’ conference was published in Vital Speeches of the Day, which normally contains only speeches by national political leaders and heads of corporations and organizations. Prof. Parrillo was a Fulbright Scholar in the Czech Republic and Scholar-in-Residence at the University of Pisa. He was the keynote speaker at international conferences in Belgium, Canada, Denmark, Germany, Italy, Poland, and Sweden. He has met with government leaders, nongovernment agency leaders, law enforcement officials, and educators in more than a dozen countries as a consultant on immigration policy, hate crimes, and multicultural education. He has done on-air interviews with Radio Free Europe and Voice of America, appeared on national Canadian television, and been interviewed by numerous Canadian and European reporters. Prof. Parrillo’s ventures into U.S. media include writing, narrating, and producing two PBS award-winning documentaries, Ellis Island: Gateway to America and Smokestacks and Steeples: A Portrait of Paterson. Contacted by reporters across the nation for his views on race and ethnic relations, he has been quoted in dozens of newspapers, including the Chicago Sun-Times, Cincinnati Inquirer, Houston Chronicle, Hartford Courant, Omaha World-Herald, Orlando Sentinel, and Virginian Pilot. He has appeared on numerous U.S. radio and television programs. Prof. Parrillo is also the author of Strangers to These Shores, tenth edition, Contemporary Social Problems, sixth edition (Allyn & Bacon), Cities and Urban Life, fourth edition (with John Macionis), Diversity in America, second edition, and Rethinking Today’s Minorities. His articles and book reviews have appeared in journals such as The Social Science Journal, Sociological Forum, Social Forces, Journal of Comparative Family Studies, Journal of American Ethnic History, and the Encyclopedia of American Immigration. He is General Editor of the Encyclopedia of Sociology for Sage Publications. Several of his books and articles have been translated into other languages, including Chinese, Czech, Danish, German, Italian, Japanese, Polish, and Swedish. An active participant in various capacities throughout the years in the American Sociological Association and Eastern Sociological Society, Prof. Parrillo has been listed in Who’s Who in International Education, Outstanding Educators of America, American Men and Women of Science, and Who’s Who in the East. In 2004, he received the Award for Excellence in Scholarship from William Paterson University. In March 2005, the Eastern Sociological Society named him its Robin M. Williams, Jr. Distinguished Lecturer for 2005–2006, and elected him as its vice president for 2008–2009.